I was thinking that the GAPS Intro might be a little too low carb for us, and it really was. On the first day we ended up adding in a ripe banana and some coconut oil. And I heated up the coffee that I wasn't going to drink during nap time (hubby had made the whole pot that morning just in case- I think he knows me!). Ahem. I can try to cut back on coffee, really! I can! but I don't think at the moment I'm going to give it up completely. So GAPS is turning into SCD (Specific Carbohydrate Diet) but keeping the parts of GAPS that worked and make sense to me, like their probiotic, plenty of broth, slowly introducing foods, ginger tea, and when I have enough swagbucks to get another couple $5 amazon certificates (I have gotten $20 in Amazon certificates so far just for searching with their search engine a couple times a day, it's easy to sign up and free- worth a try, and it adds up!) I want to get some organic cold pressed olive oil as recommended, to eat with food (they recommend drizzling it over your food, not cooking with it, as it breaks down during cooking). On both of these; GAPS and Specific Carbohydrate Diet, you're taking out complex carbohydrates in order to 'starve' the bad bacteria that produce toxins in your body and inhibit the update of nutrients. So I've been playing around with carbohydrates that are easy to digest. The picture is butternut squash, which I hadn't tried before! It is soooo good, I can't believe it's healthy :) Easy to prepare, I cut it in half, scooped out the seeds and pulp (there isn't much) and put it cut-side down on a pyrex. Added a couple cups of filtered water and a teaspoon or so of sea salt. Baked at 375 for 45 or so minutes. 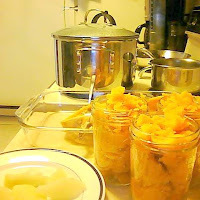 Scooped it into canning jars to store in the fridge. Behind the squash is my new 8-quart stockpot . You can see I'm still taking pictures with my webcam, so a pot is a higher priority than a camera in this house ~smile~. I linked to the one I bought (it's really nice!) on Amazon, but I got mine at Bed Bath and Beyond- it was the same as Amazon's price, but I had a 20% off coupon so that made it the best deal I could find. It's taken me a while to figure it out, but it's worth it to me to buy really nice quality things in the kitchen, and just have less. What happened to my camera? Why am I taking these lame pictures with my web cam? 0 Response to "Modifying GAPS intro to work for us"